Egg and cheese breakfast sandwiches are probably my most favorite thing in the whole world. 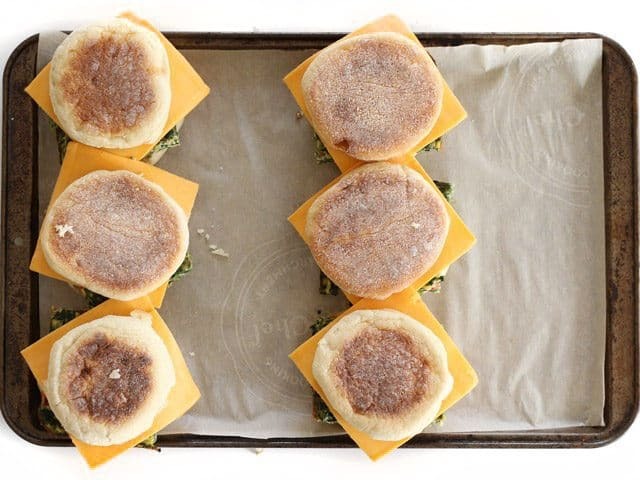 Luckily, they also freeze quite well, so on busy mornings I can just pop one in the microwave and still have my favorite food in half the time (not that it takes a ton of time to quickly fry up an egg and stuff it into a pita or English muffin with a slice of cheese, but… for those mornings). 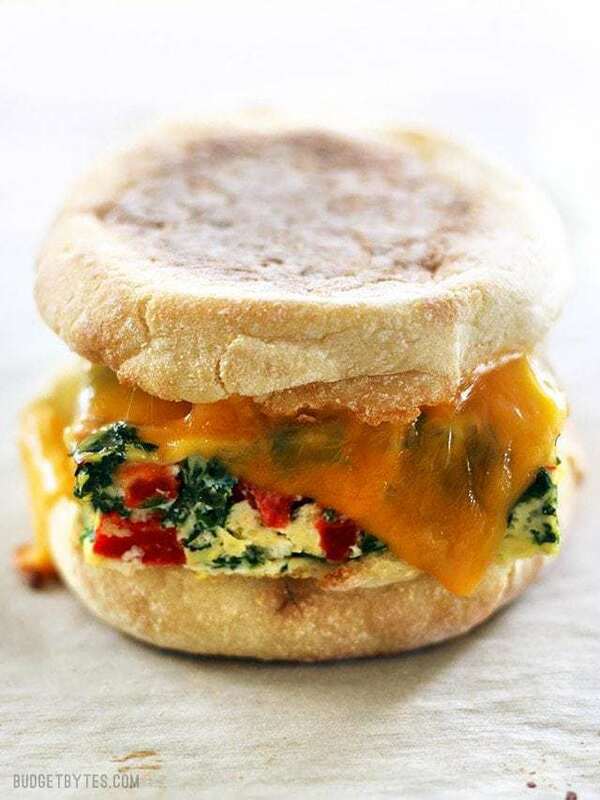 I always try to stuff a few vegetables into my breakfast sandwiches as well, so when I made these Freezer Ready Breakfast Sandwiches, I baked some spinach and roasted red peppers right into the eggs. My sandwiches came out to about $1.25 a piece, which isn’t bad considering the fact that I used pretty high quality ingredients (I’m willing to pay for “good” eggs). So, I’m getting McDonald’s prices with really high quality ingredients. Not bad. 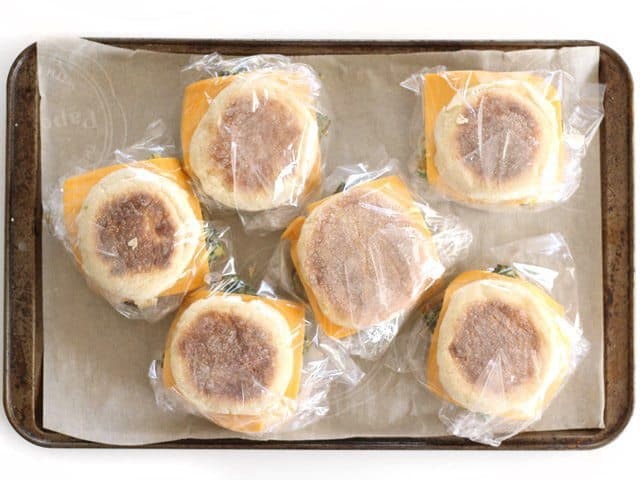 These Freezer Ready Breakfast Sandwiches are meant for quick reheating in the microwave. Every microwave is different, so I can’t give *exact* instructions, but I suggest doing a minute or so on the defrost setting first, then adding 30 second intervals at high power until the sandwich is heated through. If you transfer your sandwich from the freezer to the fridge the night before, you can skip the defrost setting and just microwave on high until hot. That’s makes it even faster! 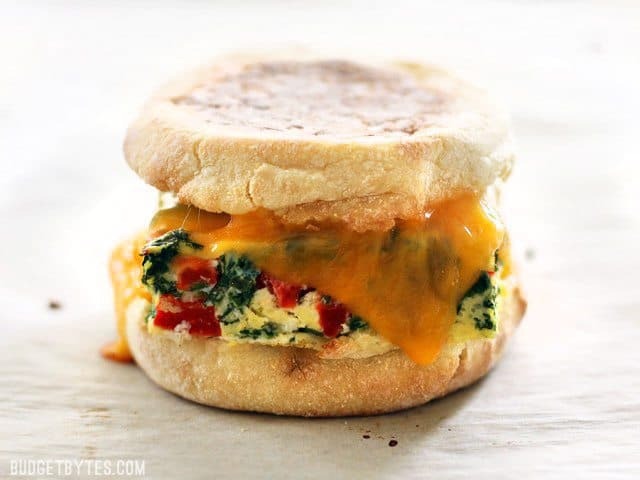 Veggie Packed Freezer Ready Breakfast Sandwiches are a filling, delicious, and microwavable make ahead breakfast for busy mornings. Preheat the oven to 350ºF. 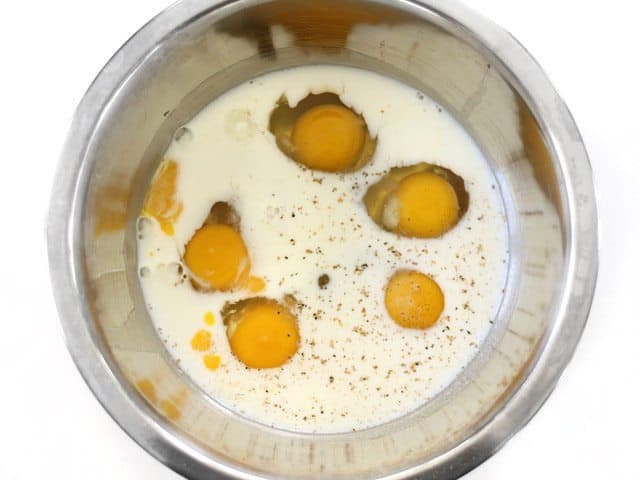 In a large bowl, whisk together the eggs, milk, salt, and pepper. Thaw the spinach (I used the microwave), then squeeze out the excess moisture. 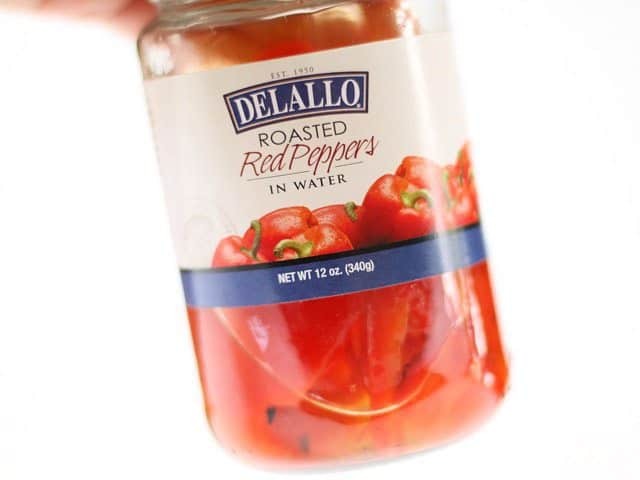 Take the peppers out of the liquid in the jar, then slice into thin strips. Cut the pepper strips crosswise into smaller pieces. 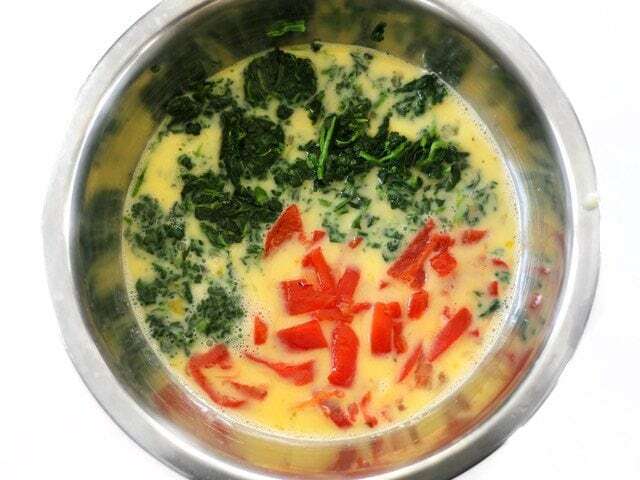 Stir the spinach and peppers into the egg mixture. Coat an 8x9 or 8x12 inch casserole dish with nonstick spray. Pour the egg and vegetable mixture into the dish. Bake the eggs for about 30 minutes, or until the center is set and the outer edges are slightly browned. Allow the eggs to cool, then slice into six pieces. 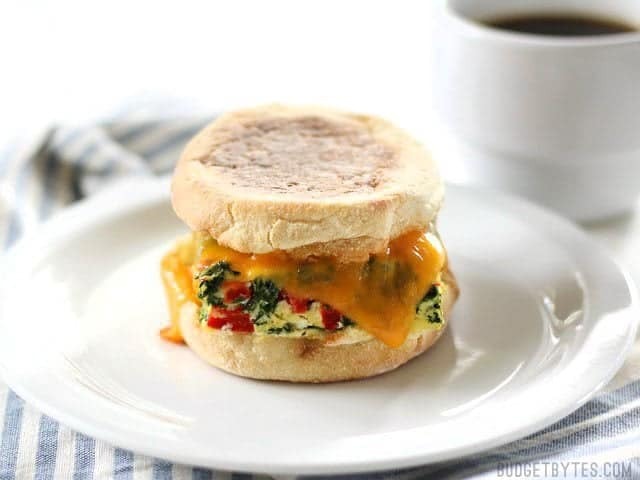 Build the sandwiches by adding one piece of the baked eggs and one slice of cheese to each English muffin. Wrap each sandwich in plastic wrap or a fold top sandwich bag, then place all the sandwiches in a gallon sized freezer bag. Freeze for up to 2 months. To reheat, unwrap the sandwich, place on a microwave safe plate, then microwave on the defrost setting for one minute. Following the defrost, heat on high for 30 seconds at a time until heated through. Or, thaw in the refrigerator over night and simply microwave on high until heated through. Begin by preheating the oven to 350ºF. In a large bowl, whisk together 6 large eggs, 1/2 cup milk, 1/2 tsp salt, and some freshly cracked pepper. (one of my yolks broke, which is why it looks like 5 eggs). 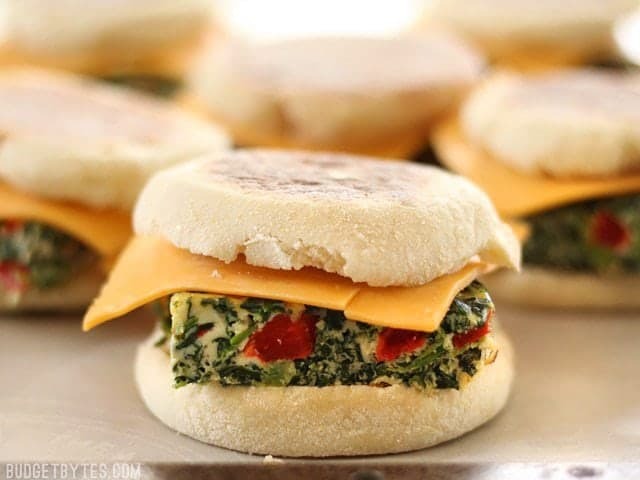 I chose to pack my Freezer Ready Breakfast Sandwiches with chopped spinach and roasted red peppers. I used half of this 12oz. jar of roasted red peppers and 1/2 lb. frozen cut spinach (make sure to get “cut” or “chopped” spinach so that you don’t have long stringy pieces of spinach). Thaw the spinach then squeeze out as much moisture as you can. Slice the peppers into thin strips, then cut them crosswise into smaller pieces. 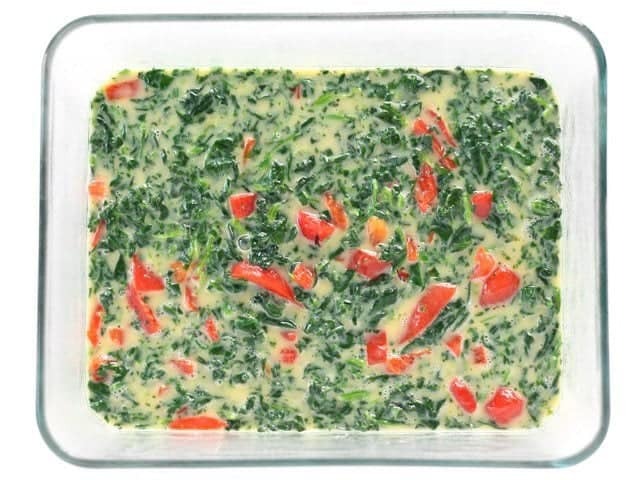 Stir the spinach and peppers into the egg mixture. Coat an 8×9 or 8×12 inch casserole dish with nonstick spray, then pour the egg and vegetable mixture into the dish. I meant to use my 8×12 inch dish so that I would have six 4×4 squares of baked egg, but accidentally used my 8×9 dish. Ooops. Bake the egg mixture for 30 minutes, or until the center is set and the outer edges are just slightly brown. Let the eggs cool, then cut into six pieces. Lay out six English muffins (opened), then top each one with a piece of the baked eggs and vegetables. 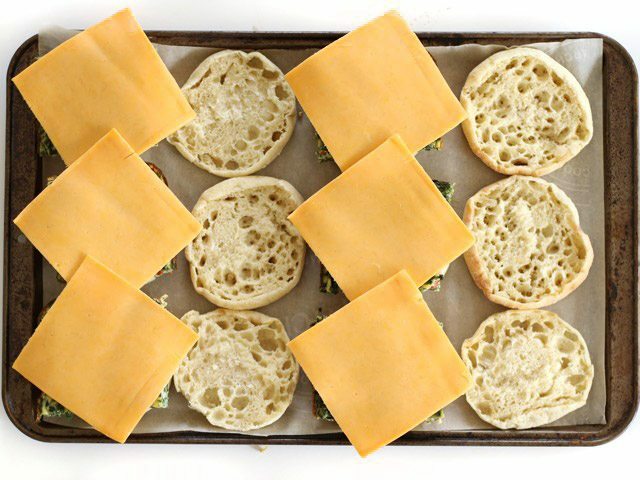 Wrap each sandwich individually first, to keep them held together, separated from the other sandwiches, and to offer an extra layer of protection from the freezer. I used little fold-top sandwich bags, but you can also use plastic wrap. To reheat, unwrap the sandwich, place it on a microwave safe plate, then microwave on the defrost setting for one minute. After defrosting, microwave on high for 30 seconds at a time until heated through. Or, you can take the sandwich out of the freezer and place it in the refrigerator the night before to allow it to defrost. Great breakfast idea. It is easy to vary the ingredients: chopped ham, grated cheese, chopped peppers, asparagus– whatever is in the fridge almost. I use fresh spinach or baby kale instead of frozen. this reduces the wetness of the final product. I also mix the grated cheese into the egg mix before baking. Freeze individually, microwave and eat them o the run. No problem with sogginess when I started using fresh spinach/kale. I’ve made these sandwiches three times now. 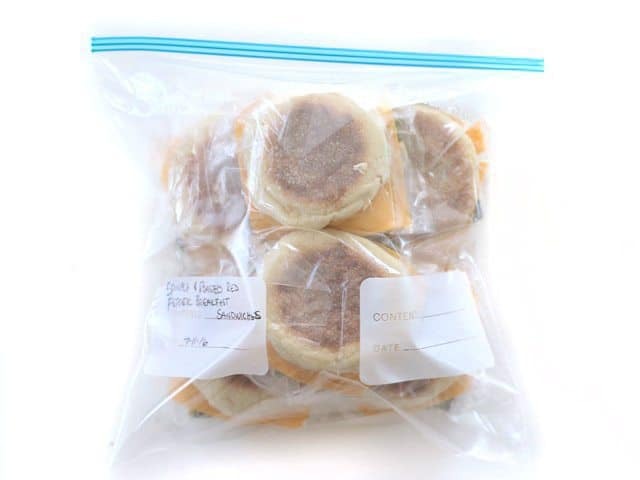 They are delicious and the perfect breakfast meal prep. This recipe is easy and fast to make, makes several servings, uses cheap ingredients, is nutritional and filling, and is quick to serve in the mornings. The only downside is the sogginess of the sandwiches after reheating, thaw or no thaw. What worked best for me was throwing the thawed spinach in a small colander and manually pressing down on the spinach, squeezing the moisture out. Skipping out on this step will leave the moisture in the spinach until it is reheated. 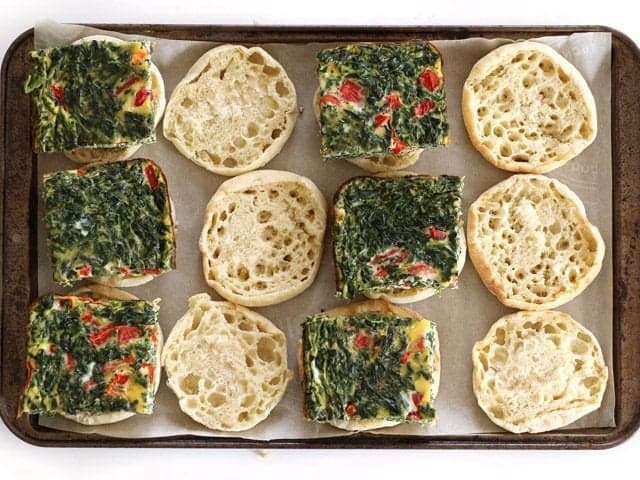 I love these but when I reheat them, the inside of the muffin gets super soggy! Any ideas on how to prevent that? How you make the egg portion is super creative! I love it! Do you think this would work as a freezer burrito? 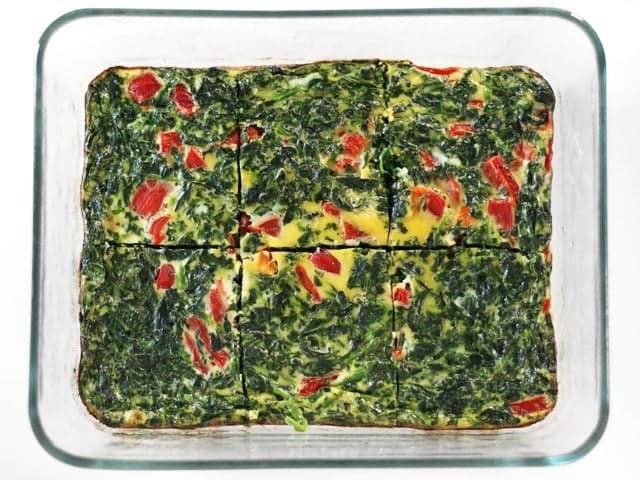 Also do you think it would be ok to add the spinach and peppers separately from the eggs?